If you haven’t taken your trees down yet and intend to use them for lumber, we highly recommend you hire us to take them down. For one reason, you will get 100% usage of your tree. We can chip the branches into mulch, cut the slabs into firewood and mill the trunks into lumber. Nothing is hauled to the landfill. The biggest reason to hire us for tree cutting, though, is the money you will save on log prep work. Unlike typical tree services, we’re experts in the end product. We know what lengths to cut the tree in for the board lengths you need to complete a particular project. We also know how to keep them clean for sawing and how to stack them for milling. We also know how to preserve them so they aren’t rotted or destroyed by bugs before sawing day. Each selective cutting job is different, please contact us for a quote. 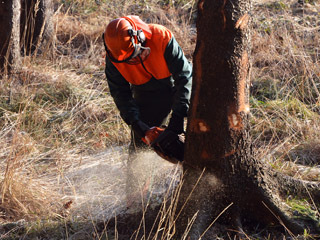 Selective cutting is used when a landowner wants to “thin out” a group of trees or cut only a few select large trees. You can read our comprehensive guide on clear cutting vs selective cutting here. Rather than laying waste to the entire area, we can harvest as few or as many trees as you’d like. Unlike the logging companies, we do not pay you to harvest your trees. Those guys are a product-based lumber brokerage business. They make their money through paying to harvest large tracts of wooded acreage, clearing it then (hopefully) recouping their money via selling to a large saw mill. WE are a service-based business that provides tree cutting, lumber milling and building services. If you’re an eco-conscious landowner who sees the value in using lumber harvested from your own land, give us a call. We’d love to give you a free quote and tell you how we can turn your woods into goods.